Back again after a long hiatus. Still finding my way. Step by step - that's how it is, really, for all of us. 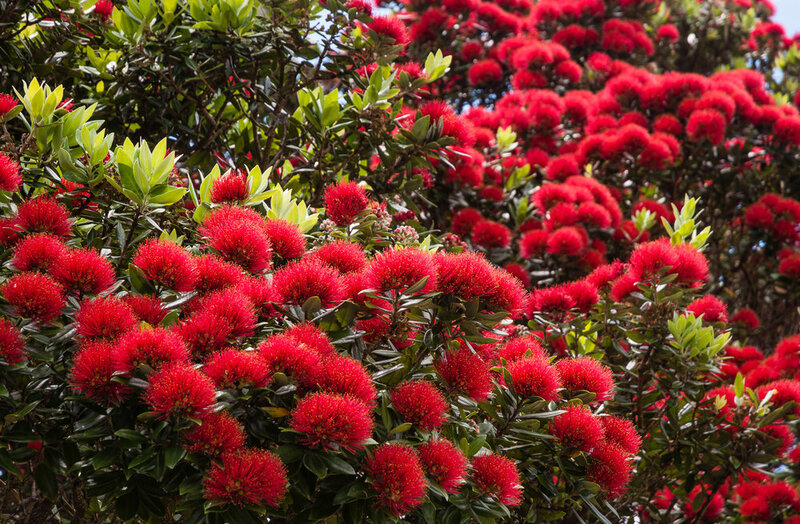 Flowering in December - the pohutukawa, sometimes called the New Zealand Christmas tree. For many people this is often a time of reflection on the year that has been and the year that lies ahead. But our human brains have a bias towards a problem focus (even when at rest) so this can become painful - often when we look back it can be tinged with regret, and when we look to the future it can be with apprehension. not judging (right/wrong, success/fail, good/bad, win/lose, etc) and no beat-ups! and considering how you will care for yourself (seeking support from others and from within) if/when you're dealing with the kinds of uncertainties and difficulties that may lie ahead in any of our lives. I am now taking a break to do some kind reflection and will be back in a month. If you have any thoughts about what you would like to see here, please get in touch. My very best wishes to you for a kind beginning to 2018! What guides you when the way isn't clear? Looking toward the headland extending from the Orongorongo range, on Wellington's south coast. 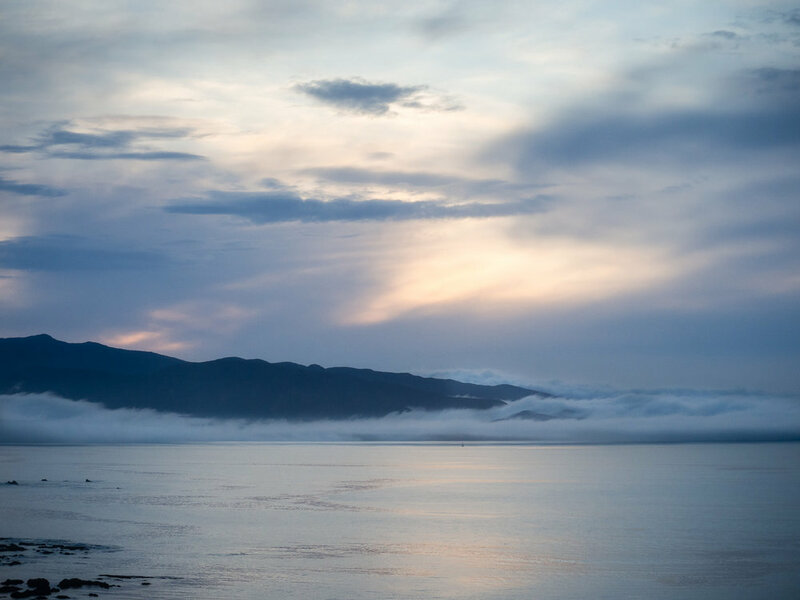 The light of sunrise is reflected in the calm water, but the lighthouse beyond is obscured by the low lying cloud. Soon it will be a new year. Where will we be heading? Who knows? You may be welcoming the holiday season, or dreading it. You may have a sense of satisfaction in what you have been able to achieve, or a sense of urgency in trying to get things done. You may welcome the idea of a fresh start with a new year, or dread the same old wishes and failed resolutions. You may be struggling with feelings of pessimism and concern for the world, or finding a way to see beyond the problems, and to be energised by the challenges. You may have a mix of feelings like these. What sustains us when the future is uncertain? (and it always is, really) We might set goals that are disrupted by events and conditions that we can't control. We can't foresee what will happen. Mostly we work on assumptions based on our current experience. So how do we find our way even when there isn't a clear map? Consider the guidelines that we use to help us make our decisions day by day. Often we aren't conscious of them, but we are guided by values, things we consider most important in our lives. And these will help us to decide what steps to take when the way isn't clear. What are the values and priorities that help you and guide your decisions? I believe that kindness is a tremendously important guide for us if we seek well being for ourselves, others, and life on this planet. with an attitude of goodwill to others. What do you think? Is this too vague? Does it sound unachievable, unrealistic in the face of the stresses in the world? What are the clouds of uncertainties that you face? Does kindness figure in your decision-making? What and who guides and helps you? How can you incorporate these principles and people in your life? How can they be there for you in 2018? I suggest that you take time to consider these important supports for you, and that you take notes as you think about (or avoid thinking about) the new year. Keep them as reminders of the things that are really important for you, that will help you to thrive no matter how cloudy and uncertain things might seem to be. You're in a dense mist, you can't see your way ahead - it could feel pleasant, bewitching, annoying - what's it like for you? do you need to see ahead clearly? is it ok to be uncertain about what lies ahead? You're with people but don't feel part of the group - do you mind, can that be ok for you? is it difficult to be alone with yourself? can you interact and try to connect despite that feeling? 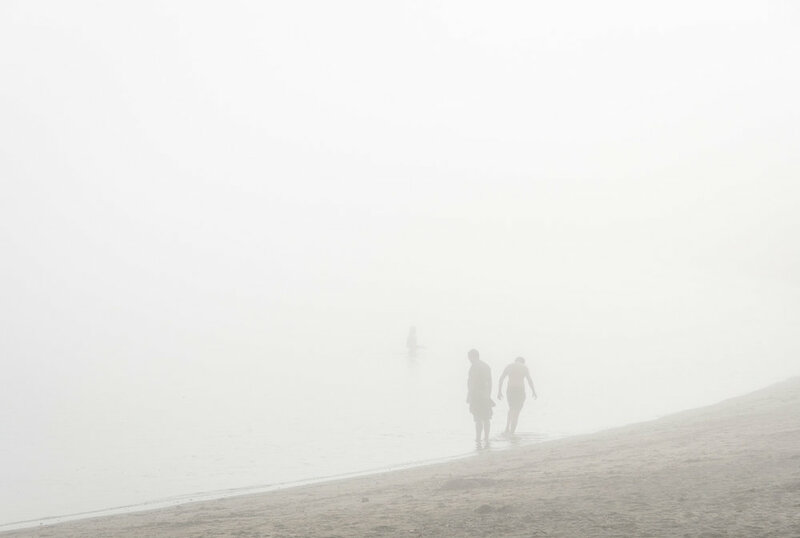 Will you stay at the edge where things are clearer, take a few steps into the water or wade out into the mist? will you seek some connection with the people with you? will that make a difference to what you try or can do? And I thought about how we humans experience ourselves as separate. But we also have an inbuilt need to be with others for a sense of safety, for support, for caring, for purpose. We need kinship - that's where the word kindness comes from. are there times when it's hard to get that balance of connection and separation to work for you? can you be there for other people and have other people there for you? can you be there for yourself? It is a kindness to notice what works for you and discover what helps you most. Are you too busy to really live life? Strange idea, eh? That we might be busily not-really-living. I'm guessing you know that disconcerting experience of finding yourself somewhere without having paid much attention to the journey getting there. How does that happen? Automatic pilot? Distraction? Things can be a blur! But does not noticing mean we are missing out? Not really living life? Does it matter if we do things so automatically we aren't noticing what is around us? Well, yes, if we are so absorbed in thought, or conversation, or such-like that we trip, bang into someone or something, miss the turn-off, etc. That's kind of obvious. But what else are we missing out on? Think about what it's like when you are in a new place and you are relaxed and able to notice and appreciate your surroundings. You may be curious, fascinated, delighted, appalled. Somehow the act of noticing makes it a rich experience. That can make travel so special. And when someone visits you and is noticing all kinds of things about your familiar environment, you see it through new eyes, and maybe get a new perspective. Very interesting. 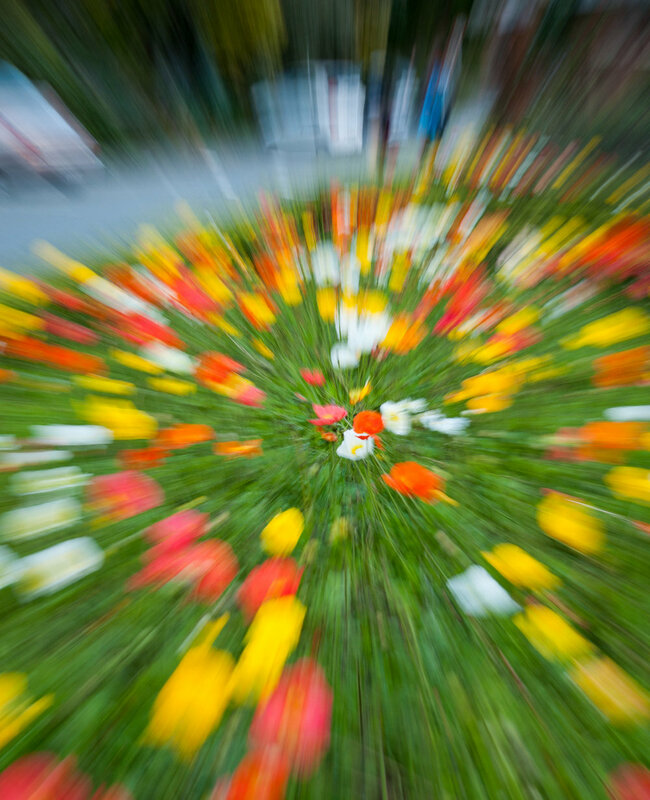 You may not want to peer into each and every flower, and the blur/adrenaline/rush can also be attractive. But when the rush is all you get, you're missing out on experiences that can be simple, exciting, calming, novel - noticing, appreciating, and absorbing some more of what life can offer us. could I have an open-eyed interest (like a tourist) in my home town? can I be an explorer in my familiar places? do I see, hear, smell, and experience what is there? or do I prefer the blur? does it make me want to do things differently? We're not all the same, but for many of us it does enrich our lives to make time to appreciate and connect with our environment. You know that feeling - that you're in over your head, everything is going wrong, it's all too much to deal with. Sometimes it seems that unkindness is in charge. You think "what on earth was I thinking?" and maybe "why was I so stupid?" You're struggling not to end up on the rocks - like a kite surfer whose struggles I saw with some horror, in very rough seas off Island Bay. 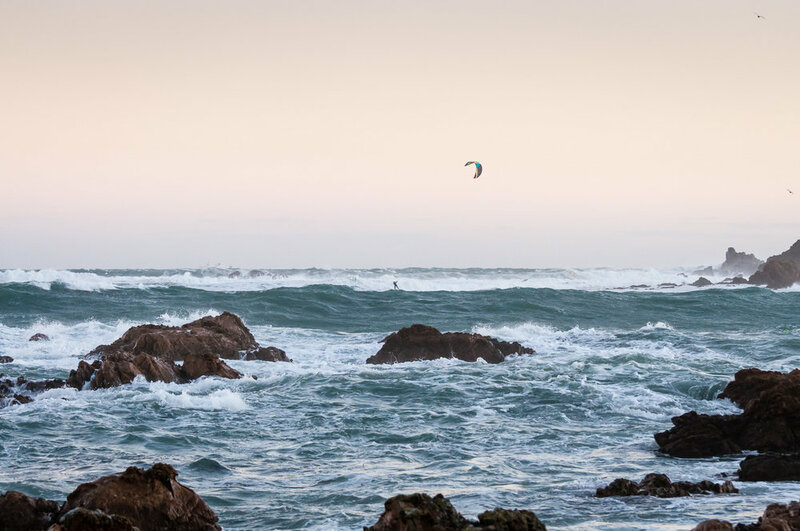 A kite surfer dwarfed by rough seas, headed for the rocks by the island Taputeranga, at Island Bay. in the ways we learn to treat ourselves - disappointment, criticism, undermining our confidence. we can avoid harsh and uncaring settings - places where there is deliberate harm or thoughtless neglect. The kite surfer could have decided not to go out in such rough seas. we can make sure that there is help and support when we are in unknown or difficult situations. The kite surfer could have worn a life jacket, or been out there with buddies rather than going it alone, so that there was someone who could help if he got into difficulty. we can strengthen skills: awareness, noticing what we are dealing with; practices which help us to stay safe and well despite difficulties we face; strengthening our confidence and resilience; becoming more able to take on bigger challenges. The kite surfer could have checked what he was going to face, and stayed in a more sheltered area (nowhere was calm!) where he could have had a very exciting but less dangerous time. we can always "have our back." We can encourage and comfort ourselves. We can speak to ourselves with a supportive attitude, and by accepting our slip-ups we can learn from them. Knowing that, we can be braver and more creative, and keep on learning. The kite surfer, I hope, had learned to have the confidence and the ability to manage such difficult conditions and his fear. With this attitude he would have gained experience and knowledge from the testing challenges he faced - and survived. When I saw this kite surfer I was very concerned for him. He was out alone in very rough seas. It looked like he was having a terrible struggle. He was often hidden by the large waves. I wasn't confident that he was intending to go so close to the rocks. But evidently he had the skills, equipment and attitude that meant he got to shore safely. Whew! I prefer things to be a bit less precarious. What do you think you would most like to strengthen when you face the kinds of rough seas that happen in your life? Can you see how kindness can be a great strengthener? Sunset colours reflected in calm water - Island Bay in a peaceful moment. Even the seabirds were still. When your mind is busy and your body tense and tired, life is not pleasant. Thoughts head into noisy negativity - focused on problems, seeing the worst, grumbling and finding fault or fear. Emotions jangle, mood drops - it's hard to feel ok. It's a kindness and relief to break free of this trap - but how? You could try this simple strategy - available to you no matter where you are. You start by focusing on something that holds your interest and attention. Look around - it could be a colour, a pattern, a kind of plant, a reflection in a puddle, interesting shadows, grass rippling in the wind, music playing, a person smiling, the scent of bread baking, a feeling of warmth. Then focus on breathing gently, not forced, and fully - down into your belly, noticing the feeling of the air on your nostrils as you inhale and exhale. Let yourself experience the thing that has taken your attention. Really pay attention to it, savour it, linger with it - all the while breathing in full soft breaths. See if you can let the moments last. And when you stop, sigh gently, and thank yourself for noticing something that has for a moment or two reminded you that the world is more than the things that are causing tension and fatigue. Sounds trivial? too little? a bit silly? Maybe you could try it anyway. What's the harm in doing something so simple? And if you do, what happens? We have a new Prime Minister who says she wants to bring kindness back with her government. Kindness! What a breath of fresh air. So often politics is made out to be a battle - rival groups pitted against each other, fighting to gain power, to get their way, to do things the way they want to and in the process pouring scorn on what anyone else does, dissing them, putting them down. Too often, that is indeed what happens. And so many of us have become distrusting and cynical about what drives politicians, who they are working for, their motivations and goals. Politicians are people whose job is to work for us, serving our best interests as people and as a nation. If we're cynical and negative about them we're not encouraging them to value us, or what we want from them. "I want it to feel like we are a government that's truly focused on everybody. Perhaps I'm more acutely aware of that sense having now led a set of negotiations in our government that brings together a range of parties. I know I need to transcend politics in the way that I govern for this next term of Parliament but I also want this government to feel different, I want people to feel that it's open, that it's listening and that it's going to bring kindness back." "I know that will sound curious but to me if people see they have an empathetic government I think they'll truly understand that when we're making hard calls that we're doing it with the right focus in mind"... "It's not about just preserving people's political careers. It's not about power. It's about being in a position to make a difference to people who need it most." Of course there will be people who scoff, or are even more unpleasantly negative about such aspirations and intentions. But I think that these aspirations and intentions deserve our encouragement and support. However, given the negativity she will encounter, there is a big question - how do we stay on track with kindness and empathy as our principles? And then I thought of the many Jizo statues which I saw in Japan. 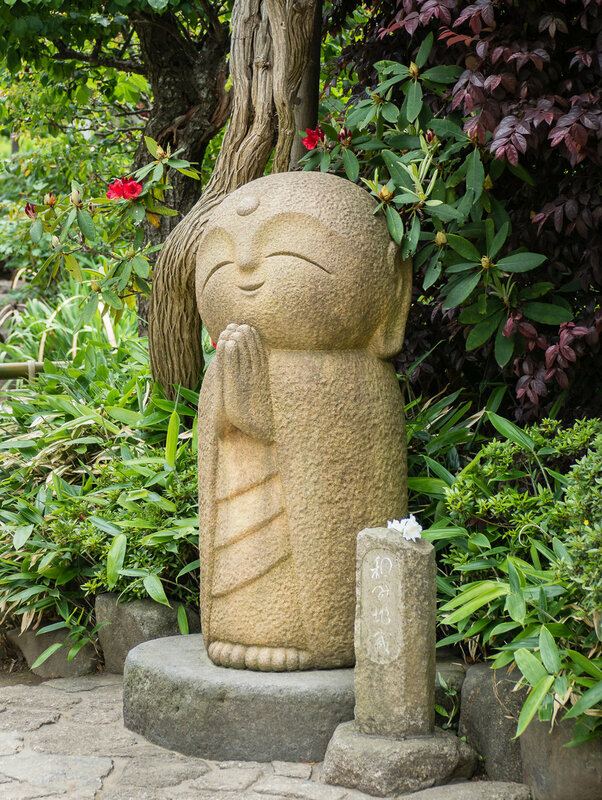 A Jizo statue at Hase-dera, a Buddhist temple in Kamakura, Japan. A cute representation of a being dedicated to relieving the suffering of others, and an inspiration and encouragement to us to cultivate courage and kindness in our dealings. Mine is a simplistic non-Buddhist appreciation of these frequently seen figures. They represent a being who is dedicated to helping others, to benefit all suffering beings. Jizo are said to embody qualities of optimism, courage, gentleness and love for all, fearlessly helping those who are vulnerable and in need - particularly caring for children, women and parents who have lost children, firefighters and travelers (it seems a rather odd mix to me.) The Jizo especially represent help for people who may be facing great challenges, and it is suggested that if you are anxious or depressed you can imagine Jizo holding you safely, like a frightened child, in arms that can be trusted. And in people's responses to them, you can see how much Jizo are appreciated. When I look at them, they are an encouragement and reminder - stick to those values of caring and courage, hold them dear. So - it might seem a big jump perhaps from our new Prime Minister with all she faces, to the Jizo. But the message is similar, and important. Cultivate kindness, and there is support for you to find the courage to stick with it. How will it be for you today? When you wake up in the morning, you want the day to go well. 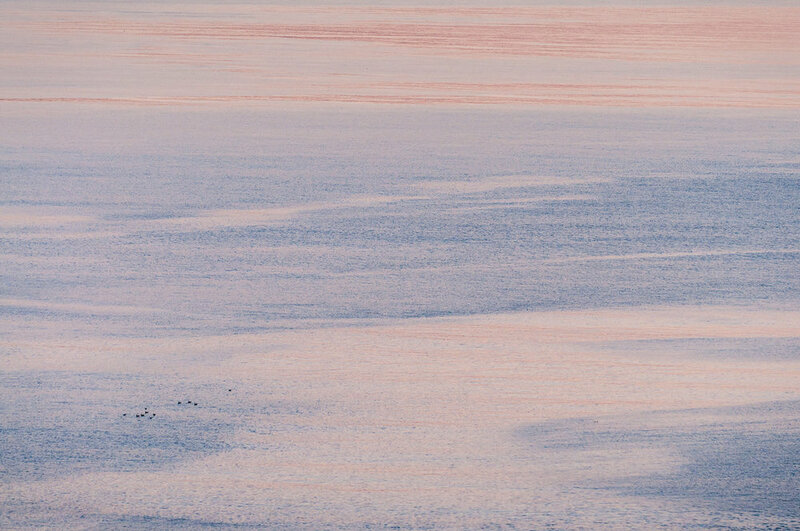 A fishing boat heads out from Island Bay at sunrise, the golden sky reflected in the calm water. "today is going to be a great day." BUT, BUT, BUT - you may well say - what if it's not true? isn't that over the top? isn't that setting yourself up for disappointment? how do you know? my life is too complicated for that to mean anything...and so on. Resistance rears its head. And BJ Fogg acknowledged that if he knew things were going to be difficult, he would say, "today is going to be great day, somehow." "today is going to be a good day" with "somehow" if indicated. Although I find putting my feet on the floor not quite a strong enough link to remember it each day, it's becoming more automatic. My celebrations are a bit muted - just yay, I remembered! I could work on that too. Are you sceptical? I reckon it's worth a try - such a tiny thing to do! What do you discover when you do it? "I will attend to my own health, well-being, and abilities in order to provide care of the highest standard." Breaking news! This statement has just been added to the Physician's Oath (a modern equivalent of the Hippocratic Oath) which was adopted by the World Medical Association in 1948. But until now there was no mention of self care in the Physician's Oath. A New Zealand doctor, Sam Hazledine, championed the cause to change this. Last year he presented a petition from thousands of Australasian doctors for it to be included. He noted, "the problem if we've said patient care comes first, it's almost like - and therefore I don't matter," and said that this was reflected in surveys showing that the number of doctors who were struggling with stress and burn-out was alarming and increasing. Research had also shown that these factors led to emotional disconnection from patients - "so despite 'first do no harm' being the core principle of our profession, the way we're being as doctors is actually causing us to harm our patients," he said. And of course, there are many people in many different roles who care for others and also suffer the same imbalance - stress, burn-out, with harm to themselves and to the people they care for. You do know that it's important to care for yourself well, don't you? It's not just if you are wanting to care well for others - those people you love, companion animals, people you work with and serve, people you don't know but you know that they are in need, the living things in the world around you - there's no end to the call we might feel from others. But being able to meet the needs of others is not the biggest reason to care for ourselves. You deserve good care because you are a human being. That's enough. If you disagree, please comment and explain - genuinely - it's important to understand what stops us from kind self-care. And here's a salutary image, a reminder of what it's like to provide shelter but get worn out - to suffer from a lack of protection, a lack of care - the barely surviving macrocarpa (Monterey cyprus) trees of Slope Point in the south of the South Island, where they are very exposed to extreme winds. 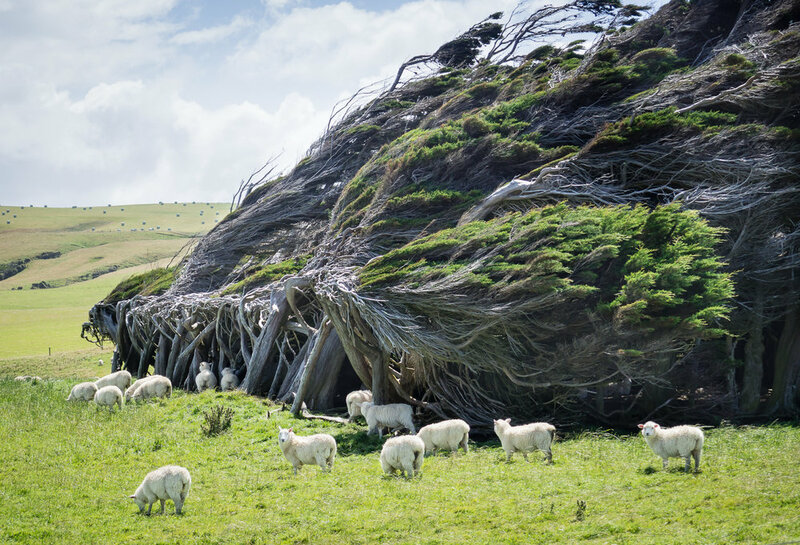 Wind sculpted and barely surviving, but providing shelter for the sheep - the macrocarpa trees (Monterey cyprus) at Slope Point in the Catlins, in the south of the South Island. These macrocarpa could have been handsome trees. In their native Monterey they tend to be wind-battered and picturesque, but in New Zealand they generally thrive - growing tall and wide, with large strong branches, producing a lovely golden timber. And this is despite the fact that they have often been planted to provide shelter - so they have not been coddled. But they have had good enough conditions to do well. Good enough care is what we all need. Whatever we have suffered and lacked, we can as adults respond to ourselves with care and concern - and in doing so, show others how to treat us too! And fortunately, we are not limited by woody lignins and all the other compounds that both strengthen the tree and restrict its options. These ones can't unbend. But we can be flexible. We can make changes in the direction of our self-care any time we choose. Where might you start? When you want to feel better - but all you can see is all the things you think you "should" do, and it's a lot - here is some encouragement from the garden. You know how easy it is to end up not doing anything because what you can do seems so tiny. Your rational self knows that you really can't do it all when you're just starting. But deep inside you is the guilty idea that you should already be doing it. What a bind! No matter how keen you are to get going with a new thing, if you're starting from "should have already" and guilt, it's like you're nobbled from the start. You're likely to end up in defeat or retreat or rebellion ("whatever!"). And somehow the messages we get about health make this really likely - it doesn't seem worth doing 4,000 steps a day if you believe that you should be doing 10,000 plus all the rest. So even if you do walk, it doesn't feel all that good because you're comparing it with what you "should" do. And then the weather's bad, or you have even more things to do, or you're just too tired and ... walks fall off the schedule. More guilt, more defeat. 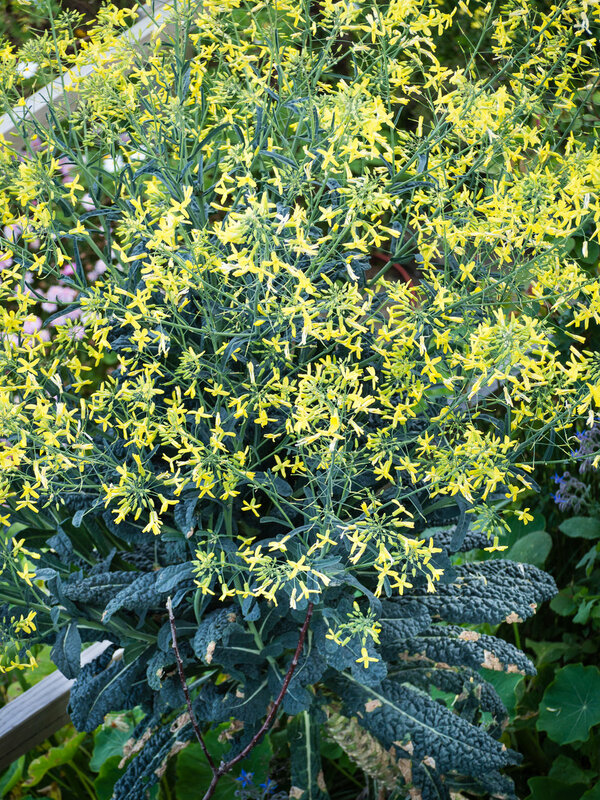 So what has a kale plant gone to flower got to do with this? Looking down on a flowering plant of cavolo nero - Tuscan kale. This rather large (as tall as me - a woman of average height) weather-battered and over-mature plant is cavolo nero or Tuscan kale. It's very easy to grow here in windy Wellington and it produces tasty leaves which you can cut and use as you go. Left in the garden to flower, it now provides sustenance for bees. And later on it will provide useful material for the compost heap. But none of this is why I am using it as encouragement. 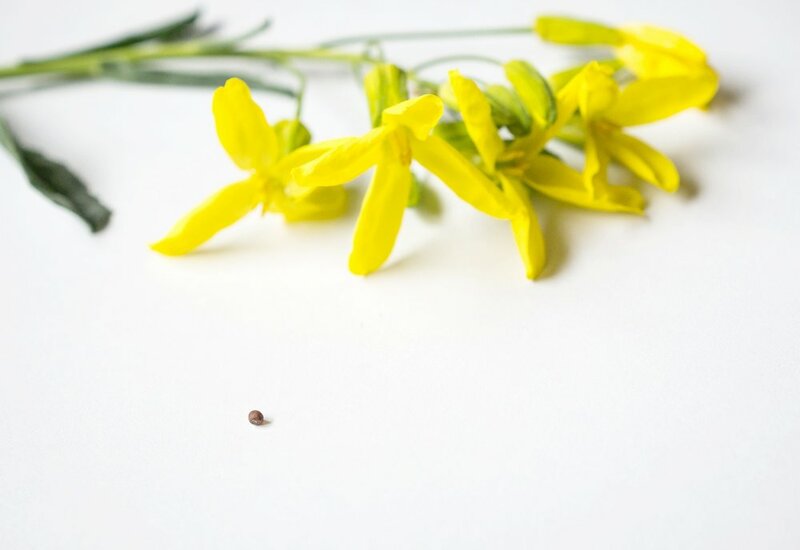 A tiny cavolo nero seed, shown with flowers from the plant for scale. That very large plant started off as a tiny seed. It needed good enough conditions to germinate and then was a tender little seeding. Bit by bit it became this very large plant, surviving the winter and continuing to develop. 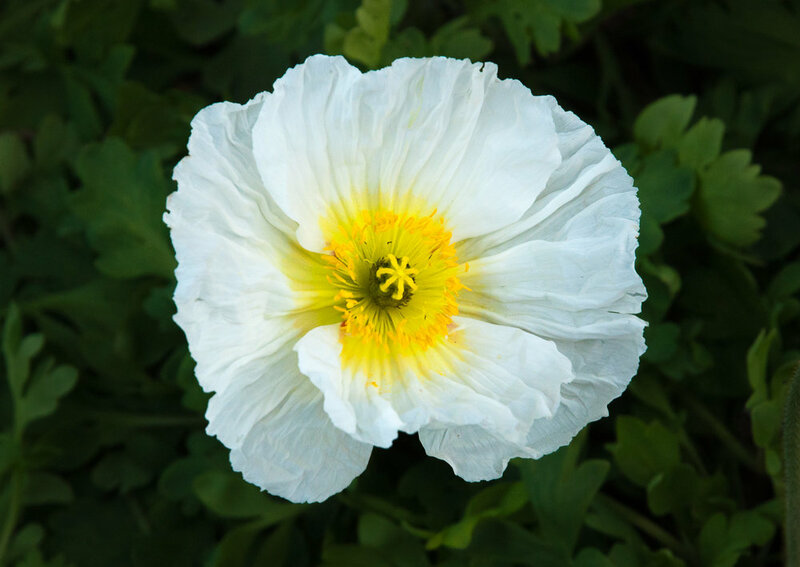 And this happens naturally - as long as it's not allowed to dry out, or get cut back too hard, or get trampled, or overcome by weeds, or pulled out, or otherwise treated badly. Ok, it's a cliche. But you get the picture. The germ of an idea, an intention, does need good enough conditions to get started and then to thrive. But, for example, the intention to get fit doesn't suddenly inflate into a full-blown exercise programme. There are steps to make, conditions to provide. It isn't a kindness to be unrealistic. But it isn't a kindness not to plant the seed if what it provides will be important to us. So - you could try thinking about your intentions as being like seeds of hope. What are these intentions/seeds that you want to plant? What conditions do your intentions need in order to flourish? What unhelpful ideas and feelings are like the bugs that eat the seedling, or the wind that will batter it and stop it from developing? What are the rewarding things that might develop from your intentions? Is this a good time to get going and prepare for planting? The good thing about getting effective at planting seeds is that we learn from experience and trying again. And that is also true of pursuing our intentions. Looking, seeing and not seeing - do we notice kindness? How much do you see kindness in your life? And what has Fuji-san (Mt Fuji) got to do with it? You must know that experience of walking along the street, eyes open, negotiating the traffic and not banging into anything - and yet completely missing seeing someone or something. And then wondering - how on earth could I have missed that? But it makes sense that we can only take in a little of what we might see, there's just so much - the texture of the pavement, the shoes of the people walking ahead, the ways that people walk, the faces of the people passing by, the colours of their clothes, the styles of their clothing, the shop signs - their fonts, colours and words, the merchandise in the store windows, the road signs, the traffic, the people who are looking down from the buses, the movement of the tree branches, the colour of the sky and patterns of the clouds, the little plants growing in the cracks of the pavement...and so on. We usually narrow down what we really take in. You'll pay much more careful attention in situations where there's something specific you need to know - if you don't know the route you'll be looking for the things that help you figure out where you're going; if you want to find a particular place you'll be looking carefully for signs or street numbers; if you think the route is dangerous you'll be on alert for signals that convey danger or safety to you, and so on. I'm guessing that you don't spend a lot of time looking for kindness. When something really kind happens, it can grab our attention. And if something really terrible happens, we'll quite likely notice kindness. But otherwise, it's unlikely to be near the top of our list of things that matter to us moment by moment. So here's a challenge - quite like a Fuji challenge! What do I mean? It might be like trying to see Fuji - but I hope not so elusive. 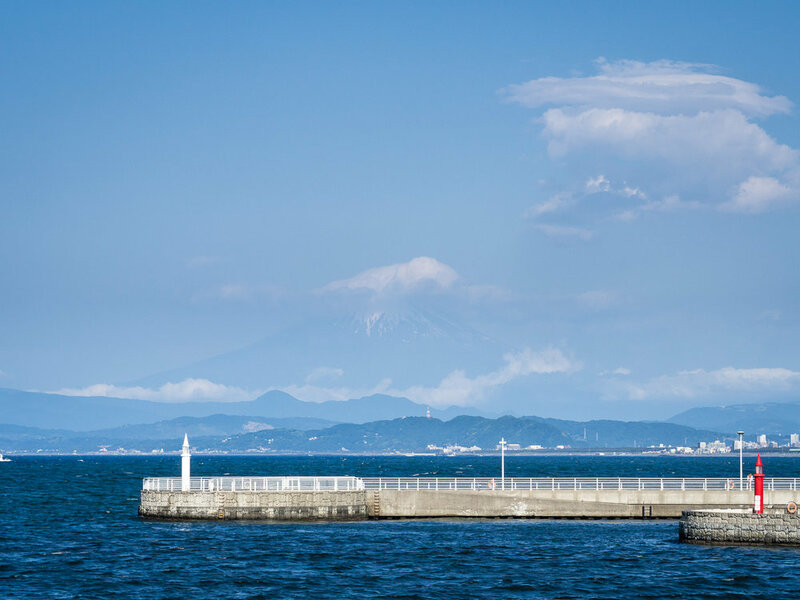 An explanation - I've visited Japan several times to see a friend in Kamakura, which is on Sagami Bay where there can be good views of Fuji from the coastline. 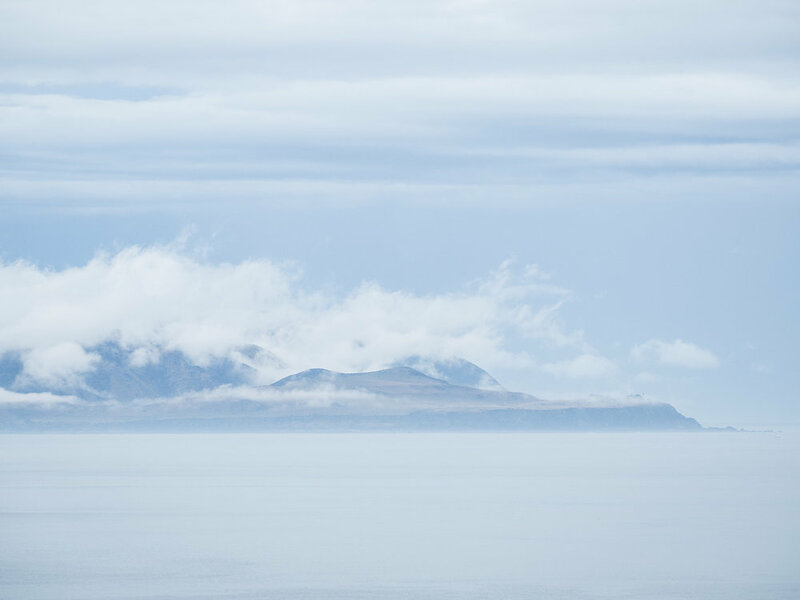 But that's only on clear days and when the weather doesn't create the mist and clouds that hide the mountain. On one visit my first view of Fuji was when I was on the train heading for Narita airport and my departure home, alas. But, like many, I really enjoy the impressive sight. So I was determined, and excited when there was a clear day after an early autumn snowfall. I knew that I might get a good view. And I did. See the image at the beginning. On the bridge to Enoshima looking for Fuji on a warm spring day, the clouds and haze doing their best to obscure the mountain. It had been an effort - it was a clear morning, so I rushed to get to Enoshima (the island in the top photo) and I was standing on the bridge - so I was much closer to Fuji, with almost nothing in the way. Grr - except the rapidly forming haze and cloud cover. Can you see the mountain? Is it as elusive as a good view of Fuji? What are the conditions when you can find it readily? What are the conditions that seem to make kindness difficult to find? Where are you most likely to experience it? When is it most natural for you to be kind or able to accept kindness? You might keep a "map" of the kindness you find in your life (like I kept ideas - a "map" - of places I might see Fuji most easily). This could be a mental map, or you could keep notes - probably that's more lasting. can I experience kindness clearly from myself or others or is it clouded by mixed messages? will I recognise it when it occurs? is there enough kindness in my life? You could keep a note of what you find, or make a comment. Where, how and when are you spotting kindness? where is it lacking? what does this mean for you? Spring is here - a new season full of hope and new life. But not so much here in Wellington with our particularly capricious (aka lousy) weather. The wind regularly blasts us back into winter mode, shattering the delicate spring blossom and bruising the fresh new leaves. It's unsettling! And it's our election day today - will we be choosing politicians who genuinely care about people and the environment? Possibly not. Does it feel to you a bit like New Year's - a time to turn over a new leaf and resolve to make positive changes? You might think about doing that, quite carefully. And even if you don't make a big deal of it you might imagine making some changes that you feel good about. But the weather of everyday life seems to get in the way. Disruptions, busy-ness, forgetting, old habits. Then regret, a bit of a beat up - you've done it again. You feel defeated or resolve to try harder. And so it goes. It doesn't feel all that great. You're likely to feel a little bit of failure, a bit less confident about yourself, a bit less optimistic, less capable. Like a wind-battered plant maybe. But I have lived in Wellington for a long time now. While I still shudder when the wind batters the vulnerable plants, I know that they can recover. They will keep growing. And they'll usually be ok, even flourish - especially if they have strong roots, good soil, enough moisture, qualities that make them resilient and protect them against the drying and damage of the wind, and protections that we can provide - watering, shelter, supports. Spring can still be lovely. Wellington has beautiful plants despite it all. We're not so different from plants in a way. These are things that will help ensure that you will be ok too. What are your strong roots and good soil, qualities that help you to be resilient and protect you from damage to your wellbeing, and what external supports do you have or need? Kindness means you can look at these aspects of your life to discover what helps and how it can be done without hurting you. 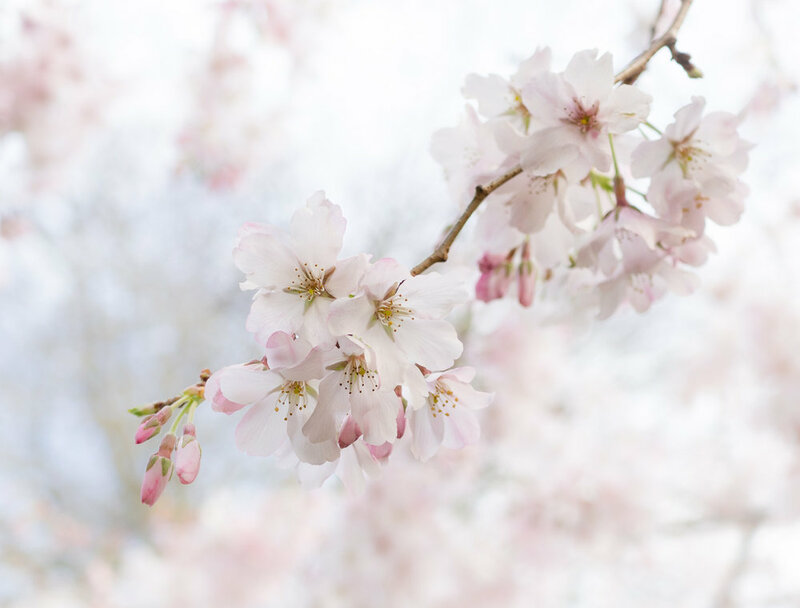 And it's not just the equinox - this is the first post of my weekly blog, devoted to enabling you to grow and flourish, and doing this with kindness.